The Amarnath row had been solved after an accord was signed. Following is the text read out by Governor's advisor S S Bloeria and Shri Amarnath Sangarsh Samiti convener Leela Karan Sharma during a joint press conference on Sunday morning. 1. The Shri Amarnathji Yatrawhich has been going on for many centuriesis a shining symbol of communal harmony and brotherhood in Jammu & Kashmir and reflective of the state's composite heritage. The Yatris have been welcomed with open arms by the people of both Jammu and Kashmir divisions and all required facilities have been made available for them. Sadlycertain decisions of the state government relating to the Yatra created misunderstandings which led to controversy and agitation and loss of many precious lives. Apart from the damage to propertythere has been a colossal loss to the state's economy in different sectors like transporttradeindustryhorticulture and tourism. 2. The Yatra to Shri Amarnathji Shrine has traditionally benefited a large number of local residentsmany of whom have crucial dependence on this annual pilgrimage for their livelihood. 3. There has been no occasion in the past on which the state government has failed to provide the required support for the conduct of the Amarnathji Yatra. On the contrarythe extent and nature of governmental support to the Yatra has been progressively enhancingfrom year to year. (Retd) Shri G. D. Sharma Prof. Amitabh MattooVice ChancellorUniversity of Jammu Shri B. B. VyasPrincipal Secretary to Governor and Chief Executive OfficerShri Amarnathji Shrine Board. 5. The Committee held three rounds of discussions with the four-member Committee nominated by the Shri Amarnathji Yatra Sangharsh Samiti (SAYSS) which comprised:- Shri Tilak Raj SharmaBrigadier (Retd)Suchet SinghProf. Narinder Singh and Shri Pawan Kohli. 6. The Governor has also held discussions with the leaders of politicalsocialreligiousacademic and other organizations in the Kashmir Valley. The predominant viewemerging out of the consultationsis that the Amarnath Yatrawhich is a centuries old tradition of J&K's rich composite heritagewill continue to be welcomed and supported by the people of Kashmirin every possible way. It was also felt that while the Shrine Board could continue to use the landas in the pastfor Yatra purposesnothing should be done to alienate or transfer the land. While an assuring convergence of views has emergedthe Governor is committed to continuing the consultative process to ensure against any remaining misunderstanding whatsoever on an issue which has earlier led to serious misperceptions and human and economic loss. A. The State Government shall set aside for the use by Shri Amarnathji Shrine Boardexclusivelythe land in Baltal and Domail (Compartment No. 63/SSindh Forest Division) comprising an area of 800 kanalstraditionally under use for the annual Yatra purposes. B. The proprietary status/ownership/title of the land shall not undergo any change. Ix. Undertaking measures relating to soil conservationland protection and preservation of ecology. 7. It has further been agreed that the Board shall continue to remain responsible for the overall arrangements of the Yatra on both the routes during the Yatra periodincluding all arrangements as mandated under the provisions of the Shri Amarnathji Shrine Act2000 AD. 8. Apart from the abovethe Committee set up by the Samiti hadduring the course of discussionspresented a fourteen-point "Charter of Demands" for consideration by the state government. 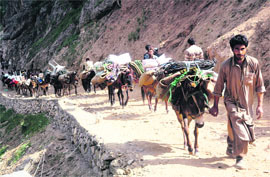 The main demands relate to withdrawal of criminal cases against various persons during the period of agitationprovision of compensation to the families of the deceased and to the injured and working out of appropriate packages of financial assistance to compensate losses of the transport sectortrade and industryhorticulture sectorhoteliers and tourist operators. The state government has agreed to examine all these demands in an appropriate manner on time-bound basis. 9. In particularas regards the registration of criminal cases against various persons during the period of agitationit is agreed that all cases of non-serious nature which shall mean bailable and compoundable will be withdrawn. The remaining cases will be reviewedon the merits of each caseby a Committee headed by Shri Anil GoswamiPrincipal Secretary (Home) within 60 days. Till the completion of this processno action will be taken in such cases. Alsospecific allegations of atrocities on agitatorsbased on prima-facie evidencecould also be looked into by this Committee. 10. Ex-gratia relief will be extended in favour of the next of the kin of the deceased and in favour of permanently disabled and the injured in all cases covered under the existing rules of the state government. 11. Furthera Working Groupunder the Chairmanship of Chief Secretary will address all compensation issues relating to both Jammu and Kashmir Divisions and the Central government will be approached for extending financial support to the state government for this purpose within a period of two months. To make the exercise meaningfulone representative from each of the affected sectors will be associated with the deliberations of the Working Group. 12. The Shri Amarnathji Shrine Board will be reconstituted keeping in view the provisions of the Act and the past precedents. 13. It is agreed that the Law Department in the state government will examine the issue of disposal of LPA in terms of the understanding made herein above within one month.